Posted on 20, March 2019 by EuropaWire PR Editors | This entry was posted in Automotive, Electronics & Machinery, Germany, Industrial, News, Science, Security & Safety, Technology and tagged AI, AI technology, artificial-intelligence, Deep Learning technology, DFKI, German Research Center for Artificial Intelligence, Hitachi, human activity recognition technology, Industry 4.0, Manufacturing, productivity, wearable devices, worker health, worker safety, workers. Bookmark the permalink. 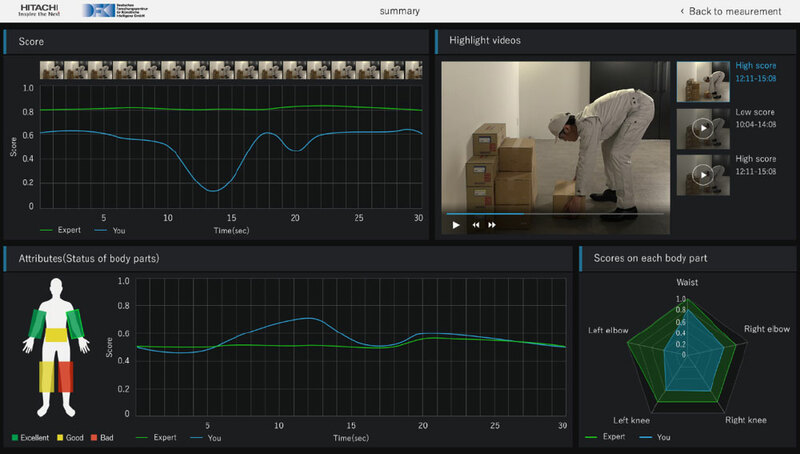 Test screen showing real-time measurement and comparison/assessment of differences with the model worker. Changes in physical load evaluation with time (upper left); Video of an improper movement (upper right). Changes in the status of body parts with time (lower left); Evaluation of each body part (lower right). KAISERSLAUTERN, 20-Mar-2019 — /EuropaWire/ — Hitachi, Ltd. and the German Research Center for Artificial Intelligence GmbH (DFKI) announced they have developed an AI technology that performs real-time recognition and quantification of physical load exerted on a worker’s body during work that is using the motion data of each body part obtained through sensors in wearable devices. The AI based technology quantifies the physical load on a worker that wears a sensor suit and provides effective feedbacks on the movement of each body part. DFKI and Hitachi will use the newly developed AI technology to contribute to workers’ safety and health through standardization of work skills in production/maintenance sites. Since April 2016, Hitachi has been running a transfer lab at DFKI in Kaiserslautern aiming at developing a cutting-edge AI technology of human-activity-recognition for industry. DFKI and Hitachi will present part of this AI technology at Hannover Messe 2019, hall 2, booth C59, to be held from 1-5 April 2019 in Hannover, Germany. Skilled labor is in shortage and recruiting new workers is becoming increasingly difficult in today’s industry. Furthermore maintaining the skill level of workers is becoming difficult in manufacturing industry and in maintenance or carrier businesses. Ensuring the safety and health of workers in production sites and assisting them in preventing danger and maintaining their health has increasingly become very important. Knowing the level of physical load during work is necessary to keep workers safe and healthy. While fixed cameras have been historically used to recognize workers’ activities they are limited in the range they can measure and it has been difficult to quantitatively and stably assess physical load in complex production sites or outside places where it is hard to eliminate blind spots. This is what the newly developed AI based technology by DFKI and Hitachi is meant to address. The AI technology uses the motion data of a worker, measured directly with wearable devices, to recognize and evaluate physical load on the worker’s body. The current technology steps on the AI based technology for human activity recognition of workers using wearable devices that was developed in and originally announced in March, 2017. More precisely, it recognizes worker’s activities (e.g. tightening a screw) using quantitative data collected through arm-band sensors and eye tracking glasses in order to prevent human errors. Now, the two organisations have combined the expertise of Hitachi in human activity recognition technology with the Deep Learning technology knowledge of DFKI to jointly develop this advanced AI technology. The new AI technology can be split into two main features. The movements of over 30 body parts necessary to recognize basic human actions are directly measure by sensors in wearable devices. AI driven models then analyze the collected data to learn how to estimate the position of each body part in advance. AI powered technology recognizes the data of certain action from the combination of each body part’s position, which allows the quantification of physical load from the action using time-series data processing technology based on Deep Learning. The motion data of the model worker measured in advance and that of a worker for each body part is then automatically compared and an AI driven model identifies specific movements and body parts that account for significant differences between them. As a result, it indicates to the worker its assessment of body parts that are causing higher physical load in an easy manner. The new AI based technology has been put in action to pick up heavy object. The results of the experiment confirmed that it can perform real-time estimation of quantitative values for the physical load of the action. Furthermore, for actions which contain bad movement, it was confirmed feedback on each body part could be provided, like movements of waist and knees are different from the model worker. Hitachi and DFKI will examine the effectiveness of giving instruction for safer operations in production sites with this technology. The newly developed AI driven technology will be utilized for operation assistance and prevention of dangerous actions in order to contribute to ensuring workers’ safety, managing workers’ health, and improving worker education in various production areas, sites and scenarios. The newly developed AI driven technology is also expected to be applied in other industries such as sports or entertainment in the future. Furthermore, drawing on previously developed human activity recognition AI, Hitachi and DFKI will aim at realizing more efficient and safer working environment by contributing to the improvement of productivity. ← Jeroen Schouten Named Regional Manager, Europe of AeroGo, Inc.